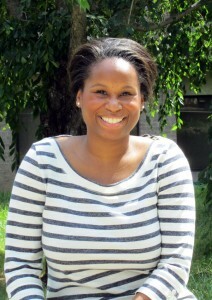 Posted July 30, 2012, in Staff News, We R Arts and Sciences Student Spotlight. After earning her bachelor’s degree, Nyeema obtained a master’s degree in education from the University of Pennsylvania, and then went to work for the New Jersey Department of Education’s Division of Student Services as an education program development specialist. While there, she felt the need for more in-depth research and analysis of the problems facing students in the state of New Jersey. When talking to her mentor, Dr. Daniel Hart, Professor II of Childhood Studies and Psychology, about her disillusionment, he mentioned that there was a position available in the new Center for Children and Childhood Studies that would be a good fit for her skills and interests. Nyeema applied and quickly found herself back at Rutgers-Camden. Working in her hometown gives Nyeema the opportunity to directly affect the lives of Camden youth. “I owe the person I am today to the education I received at Rutgers-Camden,” she says. She wanted to give others the same chance she had, and with the Rutgers Future Scholars program, she is doing just that. The Rutgers Future Scholars program gives high-achieving Camden students the tutoring and mentoring they need to achieve success, and the opportunity to eventually matriculate to one of the Rutgers campuses. The first cohort will enter their senior year of high school this year, and Nyeema is excited to see what great things these students will accomplish. Nyeema’s dedication to the youth of Camden has not gone unnoticed. Recently she became an inaugural recipient of the White-Riley-Peterson Policy Fellowship, support by the C.S. Mott Foundation. This prestigious honor was given to only 15 leaders from across the country. In October, Nyeema will attend a week-long workshop in Greenville, South Carolina, in which she and the other fellows will examine policy matters and best practices related to after-school and summer learning opportunities for children and teenagers. “I didn’t know what I didn’t know until I got here,” Nyeema says, reflecting on how her life has changed since she came to Rutgers-Camden. Truly, Rutgers-Camden didn’t know what it didn’t know until a happy accident brought Nyeema to campus all those years ago. Page last updated by Faculty of Arts and Sciences at 9:33 am July 9, 2015 . This page was printed from http://fas.camden.rutgers.edu/2012/07/30/nyeema-c-watson/ at 5:21 PM Saturday, April 20, 2019.